We all know how discouraging it is to promote something on social media and see little or no response. Every business faces the challenge of introducing a product or service to busy, media-saturated consumers. Big brands hire advertising agencies from Los Angeles or New York City to create guerrilla marketing campaigns to grab consumers’ attention. Here are a few recent examples. Amazon delivered a mysterious 40 foot cardboard box (containing a T-Rex sculpture) to The Grove shopping district in LA. The stunt demonstrated their delivery capabilities and promoted Jurassic World: Fallen Kingdom. 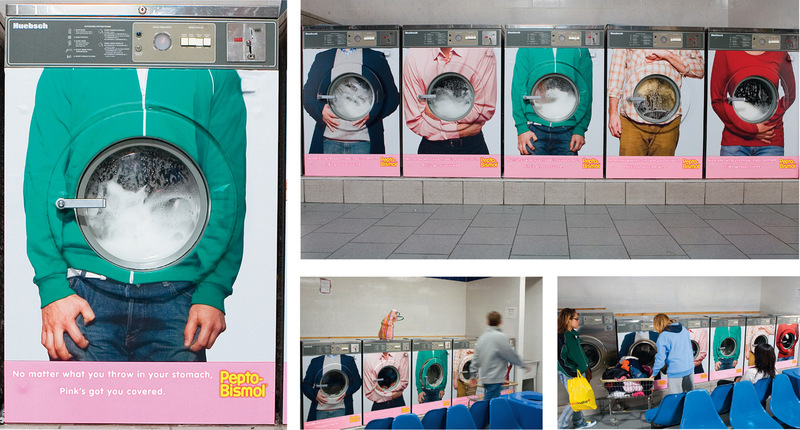 Pepto Bismol took over a NYC laundromat wrapping washers with full length photos of people. A circular whole in the vinyl exposed the washer portion simulating churning stomach acid. It was part of the “Pepto’s got you covered” campaign. Discovery Channel planted half-eaten surfboards with Shark Week programming info around beaches in Australia. jet BLUE flew pizzas made in NYC to LA addresses to promote their new cross country flights in their “Pie in the Sky” campaign. We’ve never been a fan of the term “guerrilla” in terms of marketing. It sounds forceful, gimmicky and only in the best interest of the company. However, smaller companies SHOULD consider incorporating some of the same creative principles in their own marketing. A unique, unconventional, well-conceived campaign will engage new and existing customers. Keep in mind, you don’t have to have a multi-million dollar budget to achieve your goal. Jessica Grose from Clearly Cookies created a short, low budget YouTube video of her fidget spinner cookie. It was featured on several media outlets like Food Network and HLN. While it did not result in millions of social views and likes, it did produce a ton of new customers for her business that ships cookies nationwide. Click to expand these 6 steps and start creating your own custom marketing campaign. This will save you lots of time and money, bring clarity to your message and make your campaign results measurable. Consider promoting the leading benefit of a singular product or service. Learn more about your target audience and how best to engage them. This will help you with your campaign theme, design collateral, placement, timing, etc. You can use a comment card, ask for feedback in your e-newsletter, post a poll or questionnaire on social media, create a free or inexpensive survey online with Google or Survey Monkey, examine your Google Analytics. Wow your audience with something unique. Create a conversation starter. It doesn’t need to be a large outdoor installation. It can be a video with an unusual way to display of your product, an incredible in-store experience for random customers, whatever. Just be sure it’s sharable and features a clear, measurable call to action directly tied to your specific goal. This might be a “next step” like new customers posting with your hashtag to build the brand, visiting a special page on your website, coming into your store, subscribing to your e-newsletter, making a purchase or donation online. The public presentation and functionality of the campaign needs to be flawless. Anticipate responses. Be prepared to respond to customer conversations and questions about the campaign. Turn any objections into a positive message for the brand. Make note of what worked well and what you had not anticipated. Use this to shape success for your next campaign. You can use a trackable URL from bit.ly or Hootsuite, create a hashtag, setup a dedicated Google Voice number, track use of a digital coupon code, set up a campaign in Google Analytics. Not everyone has the time to plan and execute a marketing campaign. Or perhaps you have a fantastic campaign idea but require help with all the creative collateral like billboards, flyers, a microsite, social media engagement, etc. We would love to help you think out of the box and deliver a successful campaign.